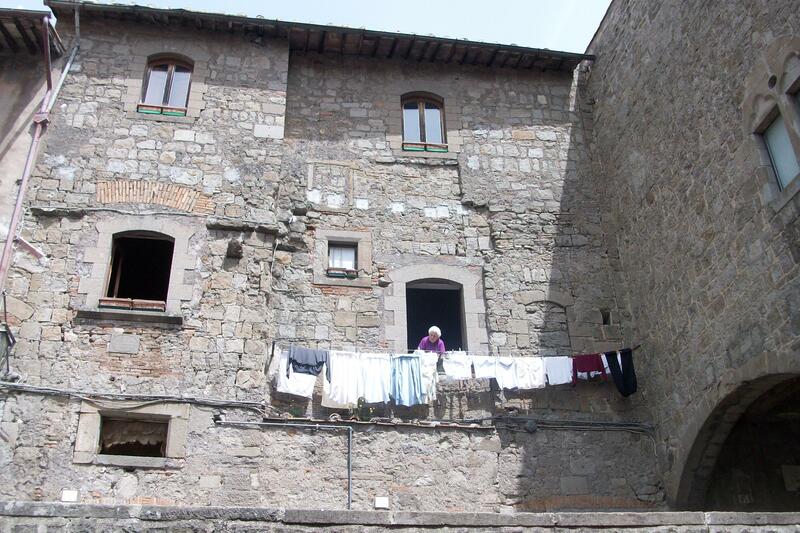 There were once 99 fountains and about 20 public wash houses lavatoi) scattered around the city of Viterbo, set in the center of the piazza or hidden inside monastery courtyards. Take an exploratory visit around the city and see how many you can find. 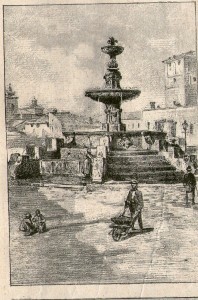 The fountain of Piazza della Morte was built around the mid 13th century. Its original name was St. Tommaso after the monastery nearby. Over the centuries the monastery’s name was changed to the Compagnia della Morte for the confraternity whose job it was to bury the abandoned dead. In 1777 the fountain ran dry but since its waters were used also in the wash house situated beneath the bridge leading to the Duomo, 120 scudi were spent to fix the fountain’s precious hydraulic system. The fountain in the courtyard of Viterbo’s City Hall (Palazzo dei Priori) was built in 1624 on a design of Filippo Caparozzi . He added two elegant niches decorated with peperino and topped with two lion masks. On the top of the niches there are two vases which once held agave plants. The two lions in bronze holding the palm tree are by sculptor Ielmoni and were added in the 19th century. Considered the most artistic of the spindle or “fuso” fountains, it was destroyed in 1367 during a bloody revolt which began when the French cardinal Carcassone’s servants washed a dog in the fountain. This was considered a sacrilege for the fountain was the only source of drinking water for the neighborhood. The fountain flows with wine once a year during the local wine festival. One of most ancient of the spindle “fuso” type, it is different from the others for the sculpted human heads that hold up the water jets. 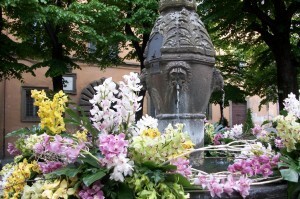 The fountain is also known as “Della Crocetta” from the name of the Crociferi priests who are responsible for the church. 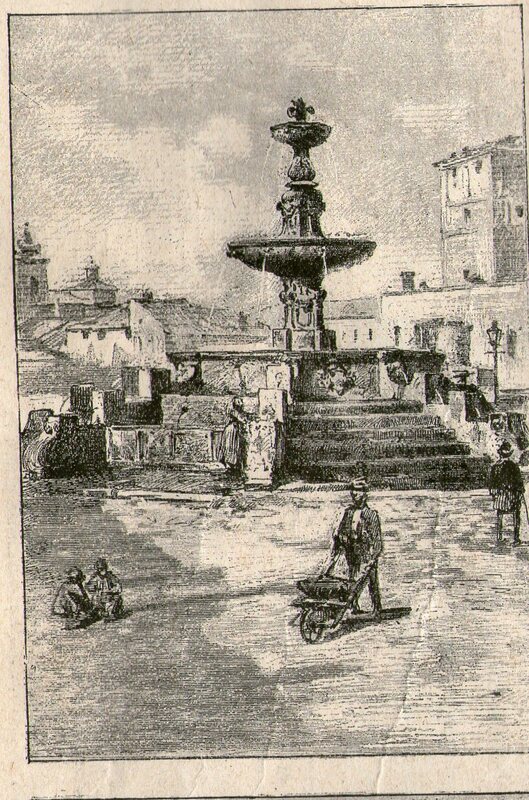 Legend says that Santa Rosa performed the miracle of the “repaired jug” at the foot of this fountain. Another of the typical “fuso” or spindle fountains, located in Piazza Dante, it was built in peperino stone in 1246. The four lion masks from which the water flows are still intact and like other fountains of the city, it has furnished drinking water to the inhabitants of the neighborhood for centuries. 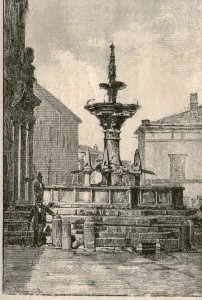 In 1731 the pipes were restored and it was moved further back in the piazza in order to widen the street. 7. Fontana della Rocca The fountain of Piazza della Rocca is known for its imposing size and its difficult history. A new fountain substituted a previous one known as San Pietro in the 15th century but it had a short life. Artists who worked on remaking and restoring it through the centuries include Vignola, Paolo Cenni and Giovanni Malanca. The fountain was completely destroyed during Anglo-American bombings in 1944 and was reconstructed in 1948. 8. Fountain of S. Faustino This fountain with its typical “fuso”or spindle form dates from 1251when sculptors Iacopo di Andrea and Gemino di Mastro Francesco created it. 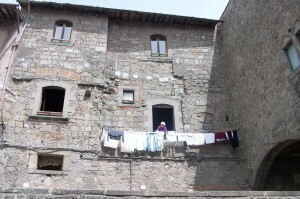 S. Faustino neighborhood was first inhabited around 1172 by people from the destroyed city of Ferento who probably paid for the fountain. 9.Fontana del Gesù In the piazza of the same name, it was built in the 11th century it was known as Fons Sepalis or Fountain without Equal. It was sculpted by Maestro Bertold and Pietro di Giovanni and then modified through the centuries. The water for the fountain comes from a 9th century aqueduct built by Consul Mummio Nigro Valerio Vigeto who used it to bring drinking water to his villa located near Bagnaccio. 10. Fontana dei Leoni The spindle shaped fountain decorating Piazza delle Erbe was built in the 16th century, modified in 1621 and then again in 1877 by the Viterbese sculptor, Pio Fedi who added four splendid lions. It holds the record for having changed its name the most times: Flajana, S. Stefano, Alessandrina, Vittorio Emanuele, delle Erbe and its present name, Fontana dei Leoni. This modern fountain in Piazza del Sacrario is dedicated to the memory of Italy’s paratroopers. On July 3,1966 when the first stone was laid the National Association of Paratroopers inserted a parchment in the fountain’s base in memory of their heroic colleagues who had died in battle . It is made almost entirely of peperino with the names of the main battles where paratroopers fought written around the borders. The bronze wings were fused by Vittorio di Colbertaldo. Copyright 2000 - 2019 Mary Jane Cryan.